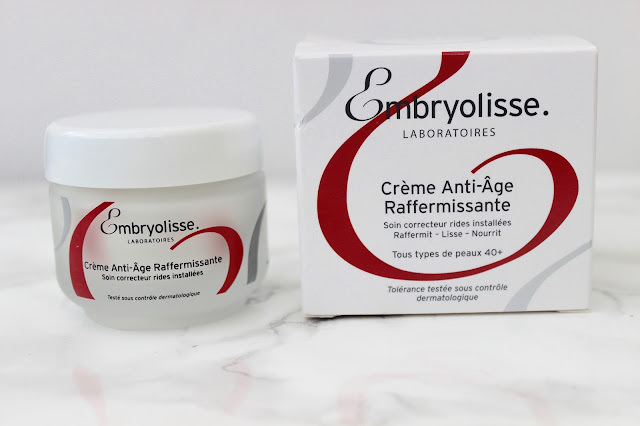 I was recently sent this Embryolisse cream to review. Embryolisse originate in France, their products are all natural. They aim for their products to be effective, highly tolerant and essential. Their anti-ageing ceam is a rich non-greasy formula, dedicated to toning and firming, creating youthful skin. This is good for dry, mature and thin skin. As this contained peanut oil ( and I'm allergic to peanuts) I didn't personally try this product myself as I didn't want to cause a reaction, but I let my family use it everyday for a few weeks and they loved it. This also contains other great products for the skin such as hyaluronic acid, sweet almond and avocado oils, vitamin A,F and E, shea butter and beeswax. I was told this was great for sensitive skin as it was nice and gentle and didn't cause irritation. It made the skin appear and feel soft, more balanced and plump. This has been used of a morning and just before going to bed. This comes in a 50ml bottle and is currently priced at £33 which I think is quite reasonable for the size of the product.